Germany is the second most popular migration destination in the world, after the United States. Of all the 27 European Union states, Germany has the second highest percentage of immigrants in its population after the United Kingdom. By UN estimates, as of 2017, 12,165,083 people living in Germany are immigrants, or about 14.8% of the German population. The German Government has been keen to encourage immigration over the past 50 years, to address the low birth rate in the country. On 1 January 2005, a new immigration law came into effect. The political background to this new law was that Germany, for the first time ever, acknowledged to be an "immigration country". The practical changes[clarification needed] to immigration procedures were relatively minor. New immigration categories, such as "highly skilled professional" and "scientist" were introduced to attract valuable professionals to the German labour market. The development within German immigration law shows that immigration of skilled employees and academics has eased[clarification needed] while the labour market remains closed for unskilled workers. 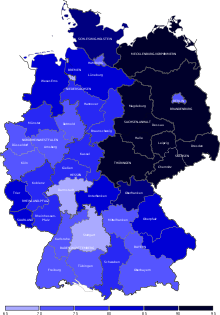 Towards the end of World War II, and in its aftermath, up to 12 million refugees of ethnic Germans, so-called "Heimatvertriebene" (German for "expellees", literally "homeland displaced persons") were forced to migrate from the former German areas, as for instance Silesia or East Prussia, to the new formed States of post-war Germany and Allied-occupied Austria, because of changing borderlines in Europe. A big wave of immigration to Germany started in the 1960s. Due to a shortage of laborers during the Wirtschaftswunder ("economic miracle") in the 1950s and 1960s, the West German government signed bilateral recruitment agreements with Italy in 1955, Greece in 1960, Turkey in 1961, Morocco in 1963, Portugal in 1964, Tunisia in 1965 and Yugoslavia in 1968. These agreements allowed the recruitment of so-called Gastarbeiter to work in the industrial sector in jobs that required few qualifications. Children born to Gastarbeiter received the right to reside in Germany but were not granted citizenship; this was known as the Aufenthaltsberechtigung ("right of residence"). Many of the descendants of those Gastarbeiter still live in Germany and many have acquired German citizenship. The German Democratic Republic (GDR) recruited workers from outside its borders differently. It criticized the Gastarbeiter policy, calling it capitalist exploitation of poor foreigners, and preferred to see its foreign workers as socialist "friends" who traveled to the GDR from other communist or socialist countries in order to learn skills which could then be applied in their home countries. Most of these came from North Vietnam, North Korea, Angola, Mozambique and Cuba. Following German reunification in 1990 many foreign workers in the new federal states of the former GDR had no legal status as immigrant workers under the Western system. Consequently, many faced deportation or premature termination of residence and work permits, as well as open discrimination in the workplace. During the 1980s, a small but steady stream of East Germans immigrating to the West (Übersiedler) had begun with the gradual opening of the Eastern bloc. It swelled to 389,000 in 1990. After the immigration law change in 1993, it decreased by more than half to 172,000. During the same time, the number of ethnic Germans (Aussiedler) -Germans who had settled in German territory sometimes for centuries until WWII, i.e. in present-day Eastern Europe and Russia- began to rise in the mid-1980s to about 40,000 each year. In 1987, the number doubled, in 1988 it doubled again and in 1990 nearly 400,000 immigrated. Upon arrival, ethnic Germans became citizens at once according to Article 116 of the Basic Law, and received financial and many social benefits, including language training, as many did not speak German. Social integration was often difficult, even though ethnic Germans were entitled to German citizenship, but to many Germans they did not seem German. In 1991, restrictions went into effect, in that ethnic Germans were assigned to certain areas, losing benefits if they were moving. The German government also encouraged the estimated several million ethnic Germans living in the former Soviet Union and Eastern Europe to remain there. Since January 1993, no more than 220,000 ethnic Germans may immigrate per year. Due to the outbreak of the Yugoslav Wars, a rising number of refugees headed to Germany and other European countries. Though only about 5 percent of the asylum applications were approved and appeals sometimes took years to be processed, many asylum seekers were able to stay in Germany and received financial and social aid from the government.As of 2013[update], the approval rate was about 30 percent, and 127,000 people sought asylum. During 2014 a total of about 202,834 people sought asylum in Germany. Even more asylum seekers will be expected for 2015 with more than 800,000 people. As of 2016, there are over 10 million  foreign nationals from all around the globe living and working in Germany, making up almost 12% of the population. As of 2014, about 16.3 million people with an immigrant background were living in Germany, accounting for every fifth person Of those 16.3 million, 8.2 million had no German citizenship, more than ever before. Most of them had Turkish, Eastern European or Southern European background. The majority of new foreigners coming to Germany in 2014 were from new EU member states such as Poland, Romania, Bulgaria and Croatia or from the Middle East and Africa. Due to ongoing conflicts in the Middle East, many people are hoping to seek asylum in the European Union and Germany. The vast majority of immigrants are residing in the so-called old states of Germany. Source: Eurostat third country nationals present in Germany. The original prediction of about 450,000 asylum seekers for 2015 in Germany rose to over 800,000 people, which is almost double the number of the previous prediction for this year and four times the amount of the prior year. [needs update] In a letter written by the Vice-Chancellor of Germany to his fellow party members, the possible number of 800,000 refugees was raised again to over 1,000,000 refugees in Germany. The 2018 Ellwangen police raid, in which residents of a migrant shelter rioted to prevent police from deporting an asylum seeker whose claim had been deemed invalid, sparked a significant political debate. Immigration to Germany as a non-EU-citizen is limited to skilled or highly educated workers and their immediate family members. Self-employment requires either an initial investment of EUR 250,000 and the creation of a minimum 5 jobs. According to a study of the Federal Office for Migration and Refugees (BAMF), around 54 percent of foreign students in Germany decide to stay after graduation. German asylum law is based on the 1993 amendment of article 16a of the Basic Law as well as on the 1951 Convention and 1967 Protocol relating to the Status of Refugees. In accordance with the Convention Relating to the Status of Refugees, Germany grants refugee status to persons that are facing prosecution because of their race, religion, nationality or belonging to a special group. Since 2005, recognized refugees enjoy the same rights as people who were granted asylum. The distribution of refugees among the federal states is calculated using the "Königsteiner Schlüssel", which is recalculated annually. Germany hosts one of the largest populations of Turkish people outside Turkey. Kurds make up 80 to 90 percent of all Turkish refugees in Germany while the rest of the refugees are former Turkish military officers, teachers, and other types of public servants who fled the authoritarian government following the coup attempt in July 2016. Among Iraqi refugees in Germany, about 50 percent are Kurds. There are approximately 1.2 million Kurds in Germany. passes a Citizenship Examination. The examination tests a person's knowledge of the German constitution, the Rule of Law and the basic democratic concepts behind modern German society. It also includes a section on the constitution of the Federal State in which the applicant resides. The citizenship test is obligatory unless the applicant can claim an exemption such as illness, a disability, or old age. he possesses family ties with his former nationality that he can not renounce for either economical, political or personal reasons. In the first three cases, the exemption is of right, in the fourth and fifth cases, an application for permission to retain the nationality of origin must be made prior to naturalisation. Typical examples of the fourth and fifth cases include where a person would be unable to inherit real property in the country of origin. (Particular problems have arisen in this regard with, e.g. Turkish applicants, in the past). Under certain conditions children born on German soil after the year 1990 are automatically granted German citizenship and, in most cases, also hold the citizenship of their parents' home country. Applications for naturalisation made outside Germany are possible under certain circumstances, but are relatively rare. According to the Federal Statistical Office of Germany in 2012, 92% of residents (73.9 million) in Germany had German citizenship, with 80% of the population being Germans (64.7 million) having no immigrant background. Of the 20% (16.3 million) people with immigrant background, 3.0 million (3.7%) had Turkish, 1.5 million (1.9%) Polish, 1.2 million (1.5%) Russian and 0.85 million (0.9%) Italian background. In 2014, most people without German citizenship were Turkish (1.52 million), followed by Polish (0.67 million), Italian (0.57 million), Romanians (0.36 million) and Greek citizens (0.32 million). According to Eurostat 47.3 million people living in the European Union in 2010 were born outside their resident country which corresponds to 9.4% of the total EU population. Of these, 31.4 million (6.3%) were born outside the EU and 16.0 million (3.2%) were born in another EU member state. The largest absolute numbers of people born outside the EU were in Germany (6.4 million), France (5.1 million), the United Kingdom (4.7 million), Spain (4.1 million), Italy (3.2 million), and the Netherlands (1.4 million). In 2018, the Wall Street Journal analysed German crime statistics for crime suspects and found that the foreigners, overall 12.8% of the population, make up a disproportionate share of crime suspects (34.7%), see horizontal bar chart. In Germany federal authorities have largely failed to provide sufficient resistance to ethnic organized crime gangs (German: Clankriminalität) as fear of stigmatizing and discriminating minorities takes precedence. All ethnic crime gangs are collectively treated as organized crime. The profitable activities of Arab clans have been noted by other minorities and Chechens, Albanians, Kosovars have created similar clan-based gangs. The clan-based structure has advantages in the individualised German society where people want to live in peace under the protection of the state. On the other hand, clans do not recognize rule of law and consider it incomprehensible that of police and courts protect people. A modern society only functions when people voluntarily follow its rules, while clan member consider themselves members of a family rather than citizens of a country. As such, they consider all people who follow the laws and rules weak and without protection. ^ "Regarding Upcoming Conference on Status of Russian Language Abroad". Russian Ministry of Foreign Affairs. Archived from the original on 2015-12-23. Retrieved 2014-06-24. ^ Herwartz, Christoph (16 June 2016). "Polen in Deutschland: Verstecken war gestern" – via Die Zeit. ^ "Publikation - Bevölkerung - Bevölkerung mit Migrationshintergrund - Ergebnisse des Mikrozensus - Fachserie 1 Reihe 2.2 - 2015 - Statistisches Bundesamt (Destatis)". ^ a b c "Ausländeranteil in Deutschland bis 2015 - Statistik". ^ "Population pressures". ECRE. Archived from the original on 2007-08-07. Retrieved 2007-08-19. ^ L’Allemagne veut attirer 40.000 Marocains par an. Bladi.net. Retrieved on 2016-06-12. ^ "Van granica živi oko 500,000 Crnogoraca". Pobjeda. RTCG. Retrieved 28 January 2018. ^ "Germany Top Migration Land After U.S. in New OECD Ranking". Bloomberg. 20 May 2014. Retrieved 29 August 2014. ^ "Konrad Adenauer Stiftung" , viewed on 31.3.2015. ^ a b c d Eric Solsten (1995). "Germany: A Country Study; Chapter: Immigration". Washington DC: GPO for the Library of Congress. Retrieved 5 January 2015. ^ a b c Kay Hailbronner (1994). "Asylum law reform in the German Constitution" (PDF). American University International Law Review. pp. 159–179. Archived from the original (PDF) on 2012-04-22. Retrieved 2012-01-03. ^ James M. Didden, (1994). "Toward collective responsibility in asylum law: Reviving the eroding right to political asylum in the US and the Federal Republic of Germany" (PDF). American University International Law Review. pp. 79–123. Archived from the original (PDF) on 2015-01-05. Retrieved 2015-01-05. ^ " Kriegsflüchtlinge aus dem ehemaligen Jugoslawien nach Zielland (Schätzung des UNHCR, Stand März 1995)", viewed on 31.3.2015. ^ "Asylbewerberleistungen", published on 4.9.2014. ^ a b "Pegida - Faktencheck: Asylbewerber". Frankfurter Rundschau. Retrieved 5 January 2015. ^ "202.834 Asylanträge im Jahr 2014", Bundesministerium des Inneren; press release 14.01.2015 . ^ Knapp 8,2 Millionen Ausländer leben in Deutschland, "sueddeutsche.de" published in March 2015 . ^ "Ausländische Bevölkerung nach Ländern". ^ "Conflicts in the Middle East fueled by religious intolerance", Retrieved May 18, 2015. ^ "Eurostat table [migr_eipre] Third country nationals found to be illegally present - annual data (rounded)". Eurostat. 2017-07-17. Retrieved 28 November 2017. ^ "Immer mehr Asylanträge in Deutschland", Retrieved May 18, 2015. ^ "Überfüllte Asylbewerberheime: BAMF erwartet mehr Zulauf", Retrieved May 18, 2015. ^ "Zuwanderung: Thomas de Maizière in Meißen zu aktuellen Asylfragen" Archived 2015-05-19 at the Wayback Machine, Retrieved May 18, 2015. ^ "Abgelehnte Asylbewerber: De Maizière setzt auf rasche Abschiebung", Retrieved May 18, 2015. ^ "Neue Prognose für Deutschland 2015: Vizekanzler Gabriel spricht von einer Million Flüchtlingen", Retrieved September 14, 2015. ^ WELT, DIE (2017-09-18). "Integration: Nicht mal jeder zweite Zuwanderer schafft den Deutschkurs". DIE WELT. Retrieved 2017-10-04. ^ a b DNN-Online. "Jeder zweite Hartz-IV-Empfänger hat Migrationshintergrund". www.dnn.de (in German). Retrieved 2018-04-29. ^ "Ordinance on employment (German)". Archived from the original on 2009-02-06. Retrieved 2008-12-04. ^ "BAMF's Graduates Study: Every second foreign student stays in Germany after graduation". Make it in Germany. German Federal Ministry for Economic Affairs and Energy. 20 February 2015. Archived from the original on 5 June 2015. Retrieved 4 June 2015. ^ "Gemeinsame Wissenschaftskonferenz – Büro – Bekanntmachung des Königsteiner Schlüssels für das Jahr 2014". 4 January 2015. Archived from the original on 2015-01-05. Retrieved 5 January 2015. ^ "Auffallend viele kurdische Flüchtlinge". ^ "Asylanträge von Türken in BW: "Fast 90 Prozent sind Kurden" - Baden-Württemberg - Nachrichten". ^ Editorial, Reuters. "Turkish asylum applications in Germany jump 55 percent this year". U.S. Retrieved 2018-09-11. ^ "Report: At least 1,400 Turkish nationals claimed asylum in Germany in Jan-Feb alone - Turkey Purge". Turkey Purge. 2018-04-02. Retrieved 2018-09-11. ^ a b c Federal Government Commissioner for Migrants, Refugees and Integration. Wege zur Einbürgerung. Wie werde ich Deutsche? – Wie werde ich Deutscher? 2008. ^ Federal Office for Migration and Refugees (BAMF). Migrationsbericht des Bundesamtes für Migration und Flüchtlinge im Auftrag der Bundesregierung. Migrationsbericht 2012. 2014. ^ Federal Statistical Office of Germany (Destatis). Foreign population, 2007 to 2013 by selected citizenships. ^ a b Pancevski, Bojan (2018-10-15). "An Ice-Cream Truck Slaying, Party Drugs and Real-Estate Kings: Ethnic Clans Clash in Berlin's Underworld". Wall Street Journal. ISSN 0099-9660. Retrieved 2018-10-16. ^ a b Ghadban, Ralph (2018-09-28). "Die Macht der Clans". sueddeutsche.de (in German). ISSN 0174-4917. Retrieved 2018-09-29. Wikimedia Commons has media related to Immigration in Germany. "Unsere Aufnahmekapazität ist begrenzt, ..."
This page was last edited on 12 April 2019, at 12:34 (UTC).